Can You Imagine Having an Arrow Through Your Head? 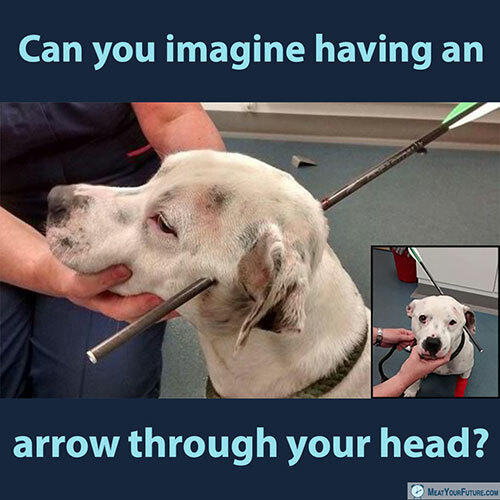 How upsetting is this, that someone intentionally shot this sweet dog with an arrow? He was found wandering aimlessly, in pain and confused, with this arrow through his head. Amazingly, the arrow didn’t damage his brain, and he apparently survived. He is added to the long list of dogs and other companion animals who are purposefully killed or abandoned by humans. But, if seeing a suffering dog upsets you, then what about the countless other animals who are hunted and shot, often left injured by bullet wounds, or even similarly impaled with arrows, many being left to slowly die, confused and in immense pain? And, what about the countless billions of domesticated animals who are bred, exploited and killed for their meat, dairy and eggs – like cows, chickens, fishes, pig and goats? Just because their body parts and byproducts are served in restaurants and stores everywhere, and most people consume them quite happily, it doesn’t change the fact that those animals also had an unnecessarily cruel, premature and violent death. Whether dog, deer, fish, pig, cow, or any other animal – they all value their lives and desperately do not want to die, and they all have the capacity to experience fear and pain, just like we do. The only “right” animals need from us is the right to not be exploited or needlessly harmed and killed. Other species were on this planet for millions of years before we humans even existed – they are not here for us, they are here with us. And we can have happy, healthy lives without using or intentionally harming them. So, why would we continue to do so when we don’t have to? Please consider what we owe to other animals, and live vegan. It’s quite literally the very least we can do, if we think animals matter morally. A mass shift away from animal foods is also desperately needed from an environmental perspective as well, to adequately feed our ever-growing human population, and to avoid destroying the only planet we call home.